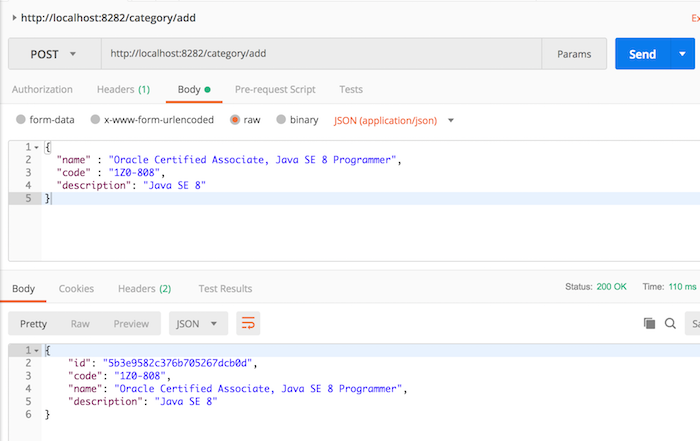 Unlike the Core Category Service, the API Category Service only receives a request and then calls the Core Category Service to perform this request. Therefore, in order to build API adding new category in API Category Service, there are a few things we have to do first. The first thing we need to do is add a new Category object to contain the category information. As you can see, in the CoreCategoryServiceImpl class, I’ve injected information about the base URL of the Core Category Service. OK, everything is ready, now I will go to the main part of this tutorial. With this declaration, I also expose APIs for the API Category Service with the request URL that starts with “/category”. As you can see, here I have used the WebClient object to connect to the Core Category Service and call the API adding new category of this service with the URI “/category/add”. At this point we have completed building a new API for adding new category for the API Category Service, let’s test it. The last thing we need to do is add a new Unit Test to the code that we just added. I will create a class named CategoryControllerTest located in the src/test/java folder, com.huongdanjava.categoryservice package to test the CategoryController class.